Why Aren’t You Eating More Beans? People constantly ask me what they should eat to help them reduce their cholesterol. So, naturally I start listing food items that I know help lower cholesterol, such as, oatmeal, oat bran, walnuts, almonds, fish, olive oil and beans. Beans are among the healthiest foods that you can eat. They provide a multitude of nutrients and antioxidants that can help lower cholesterol, fight infections and diseases and may even lower the risk of certain types of cancer. The United States Department of Agriculture placed beans in their number one spot, out of twenty, for the common food that has the highest-antioxidant levels. Calcium – Necessary for growth and maintenance of healthy bones and teeth. A calcium deficiency can lead to rickets and osteoporosis. Iron – Increases your energy and protects you from infection. Zinc – Important for healthy skin and immune system. Potassium – Aids in promoting proper muscle contraction and nerve impulses and promotes optimal electrolyte and pH balance in your body. It also helps to regulate blood pressure. Folic Acid – Decreases risk of spinal birth defects and has been shown to decrease risk of cardiovascular disease. Protein – Necessary for growth, development and repair of body tissues and muscles. Fiber – Helps relieve constipation and helps with weight loss by creating a feeling of fullness. Fiber also lowers your chances of developing conditions like heart disease, some cancers, diabetes, kidney stones and diverticulitis. 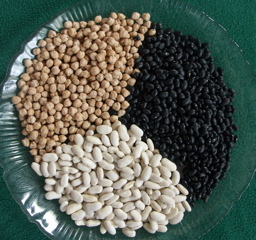 A common problem with beans is gas, which is caused by certain complex sugars that cannot be digested. But the good news is that there are things you can do to minimize this gas. Try to purchase the freshest dried beans. It seems that the longer the bean has been sitting around, the more likely it is to cause gastrointestinal discomfort. Soak your beans overnight and discard the soaking water 2-3 times. The complex sugars are released into the water. Then when boiling the beans in water, make sure to discard the water again. Don’t use that water in a soup base. If that’s not enough or you aren’t able to make your own beans from scratch, you can add a food enzyme dietary supplement to your beans before eating them, such as Beano to help break down the complex sugars and reduce gas. These methods listed above can eliminate a significant amount of the gas-producing complex sugars. If you don’t have time to start from scratch and you buy canned beans instead, be aware that they have extra sodium. If you don’t want that sodium, make sure to wash the beans off first. That should remove a lot of the salt. Beans are also a great, low fat food. They contain no cholesterol, little fat (except soybeans which are high in unsaturated fat) and have a low glycemic index. That makes beans great to consume if you are diabetic or trying to lose weight. Plus, beans provide almost the same amount of protein as meat. Usually, one or more essential amino acids are missing, but that gap can be filled by eating other foods such as bread, rice, dairy products or small amount of meats, when eaten the same day. However, the protein in soybeans is considered by many to be a complete protein source. So, why are you not eating beans again? Really though, they are great, but didn’t know the antioxidant concentration. I think some people don’t realize that each bean has its own flavor. Just because they dislike one bean doesn’t mean they’ll hate ’em all. I’m a lucky one too..love’em and can eat’em. I love black beans in my salads. Nice post Talli–and no excuses folks, eat ur beans! @Sean It depends where you get the refried beans from. At fast food places they tend to be full of saturated fats or trans fats. However, if you make it on your own it can be healthier. First of all, Talli is so right,eat more beans! I believe the more beans you eat, the less gas you will experience. It’s similar to eating certain fresh veggies, such as, broccoli or cauliflower, once your body gets use to it, then you are good to go. I love beans. My mom is from Guatemala, so naturally, I grew up eating beans. Great info on the beans. thanks! i think i eat TOO MANY beans. If i could only eat garbonzo beans for the rest of my life, Id abe one stinky, happy camper. You’ve got me into beans! Very true, I eat alot of beans, beans on toast is lovely. The thing I find with beans is they are so easy to have, they are so adaptable and work in lots of combinations. I think alot of people underestimate the value of beans. Didn’t know you could minimise that so I learn’t something here and thanks for that, I can make sure I DO that when I cook em for my boys! Ah, the forgotten world of legumes! I eat beans regularly and as you mentioned, soaking the beans overnight is a great way to curb any digestive issues. Now there’s no excuse not to eat them. Thanks for that great post Talli! I have learned to love beans. I embrace them. Cook lovely meals with them. They are a side dish, a main course, and a nice appitizer. If you have Celiac’s, like my daughter and I, beans replace oatmeal, bran, and all those other gluten ladden, colon cleaning goodies! Plus make a mean white bean and ham soup that is to die for! I love beans….I don’t love my hubby on beans. I can’t wait to try your technique. Off to look for some recipes….. I love me some beans! Great post….so much information! Thank you!